Great teams aren't built person by person. They're built behavior by behavior. Leaders know that improved teamwork—and the behaviors that surround it—is a critical factor in employee engagement, retention, inclusion, and empowerment. They've read the results from Google's Project Aristotle, which encourages the modeling of behaviors with workplace teams to create increased psychological safety, dependability, structure, and clarity. IBM Smarter Workforce Institute puts it another way: Leaders should be offering their employees opportunities to participate in decision-making and trust them with the autonomy to find the best paths to achieving success. But when we talk directly with leaders and their teams, no one asks us about any of that. Everyone knows the benefits of things like clarity, dependability, teamwork, and collaboration. It's the specifics that aren't clear, leading teams to ask us: How do we get those things? Our answer is always the same. Create a culture where coworkers are designing and building the team experience they want. Create shared rituals. Why rituals? Rituals cultivate behaviors that help team leaders and members be successful 'and' create positive working experiences for their talent. Just as teams change and grow, so do the rituals that bind them together. Cueing the appropriate ritual with a struggling team can transform their work. Teams regularly evaluate whether their rituals are helping them achieve shared goals, and if they aren't, they redesign the rituals. Over time, the behaviors modeled in the rituals become part of their routines. Rituals and routines are integral to how work gets done on high-performance teams. And we're not talking about fluffy team-building activities. Instead, we're talking about rituals that ask for input from each individual and shape it into a shared point of view. We're talking about routines that support inclusion, grow accountability, and foster a deeper sense of ownership. We're talking about every team having the ability to transform their day-to-day experience of working together. Rituals are group activities during which people go through a series of behaviors in specific order. Some of these behaviors are established, while others may be new. 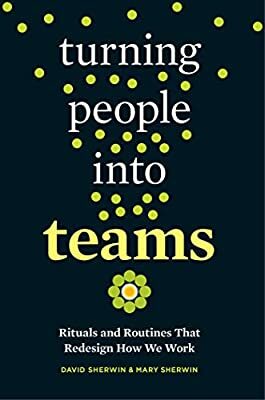 Teams create rituals for two reasons: to support the behaviors they want to see from each other, and to respond to the needs of their organization. Rituals can be expressions of an organization, and they can signal the values of their unique culture. Some rituals are small and specific, such as the sounding of a gong before a meeting or a monthly lunch-and-learn. Other rituals are part of larger, more complex systems, ranging from a week-long onboarding process for new team members to the one-on-one meetings that prepare employees for their yearly performance reviews. PART 2. WE'RE STUCK, NOW WHAT?